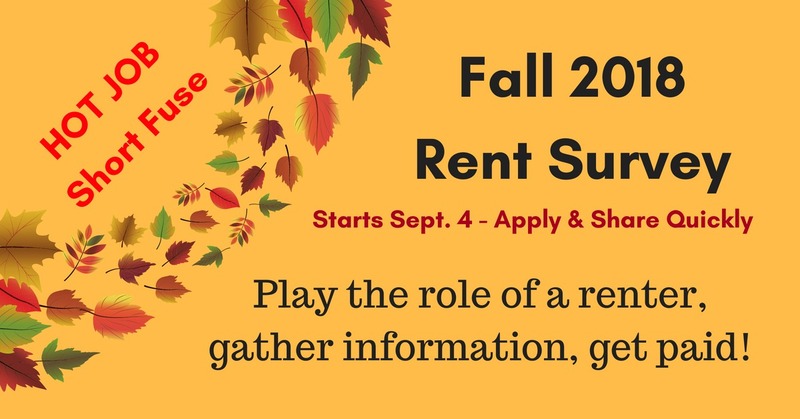 Fall 2018 Rent Survey – Play the role of a renter, gather information, get paid! Twice annually, Yardi Matrix hires people to conduct Rent Surveys from home. The job is temporary, but we hear GREAT THINGS from people who have done it! And background noise is fine! This position involves “PLAYING THE ROLE OF A PROSPECTIVE RENTER” and calling apartment complexes to gather data by asking various questions. So background noise is fine — it makes your call sound more authentic. This is a short-term, project-based role – it is not a permanent position. From folks who have done this in the past, we have received the following advice for newbies, “Follow instructions and be as accurate as possible. Work that is not complete or is not completed accurately, will not be paid. These jobs FILL FAST, so don’t wait to apply or share if interested! “The Yardi Matrix apartment information service is a high-performance system with the sole function of supporting the commercial apartment industry’s dominant participants. The company’s services monitor the 50+ unit apartment universe from the property level to the submarket/market level in a form unique within the commercial apartment information industry. Why We Conduct Surveys – Our product provides information on various dynamic aspects of apartment community operations, requiring that regular assessments be conducted. The Rent Survey updates an apartment community’s rents, current rent specials, and several other factors subject to frequent change. The process requires calling apartment communities and asking various questions. Computer/Telephone Need – High speed Internet access and long-distance telephone service are required. There is no selling involved, but apartment communities are called to ask them simple questions about their apartments, a process requiring good telephone etiquette and a pleasant demeanor. Surveys are Conducted as a Renter – Surveys must be conducted as a potential renter to ensure accuracy of information. This requires that you be willing to play the role of a renter. Survey Timing – Survey team members must have a minimum of 75 completed surveys the first week, and 100 completed surveys each week thereafter, with calls made between the hours of 9:00 AM and 6:00 PM within surveyed time zones. *A completed survey is one that has been marked Done, meaning no further calls are needed; surveys marked Part Done, Answering Machine, No Answer or Wrong Number do not count towards fulfilling these requirements. Compensation – Surveyors will be paid $6 per hour and a piece rate of $.50 for surveys marked Done, $.30 for surveys marked Wrong Number, $.20 for surveys marked Part-Done, and $.07 for surveys marked Answering Machine or No Answer. You will receive at least minimum wage in your jurisdiction for all hours worked; however, you can earn more depending on your speed and efficiency. Employment Status – If invited to the Fall 2018 survey, you would be an employee of Select Staffing on a temporary assignment with Yardi Matrix. Click here for full details and to apply. To see more jobs like these, check our Newest Jobs & Gigs page. To be the first to hear about jobs like these, like our Facebook page and check your feed for our posts. Good luck in your work from home plans! This entry was posted in Hiring Companies, Jobs That Don't Require a College Degree, Work at Home Jobs and tagged Yardi Matrix. Bookmark the permalink.